Many parents in this day and age are told that their child exhibits symptoms of ADHD or ‘attention deficit/ hyperactivity disorder’. The term itself has only been coined within the last few decades, but there have been different names for children exhibiting an extreme difficulty in sitting still or paying attention for many years. Certainly in the 19th century, these symptoms likely showed themselves and were simply referred to as the ‘jitters’. However, as time went on, there became a popular belief that the condition was beyond a person’s control and was an actual medical issue. As names such as “Post-Encephalitic Behavior Disorder.” began to make their appearance as early as 1922, there seemed to be the problem of what to do or how to treat this condition. These children, while usually very bright, were unable to get work done in a conventional environment. Their behaviors were disruptive, and the possibility that this was not something that could be helped urged the medical profession to find answers. In 1937, the first use of stimulants for treatment of these attention disorders was advocated by Dr. Charles Bradley. This was continued in 1956, when Ritalin became the drug of choice for treating this problem. It would be 1980 before the medical profession would coin the phrase Attention Deficit Hyperactivity Disorder after observations indicated other symptoms that went along with difficulty in sitting still. The inability to focus for any period of time or concentrate on studies and schoolwork has made Ritalin and Adderal two of the most prescribed drugs on the market today. 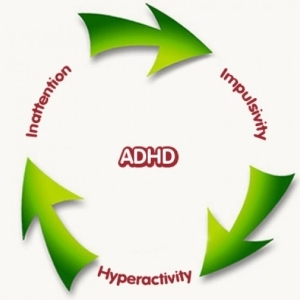 The controversies surrounding over-diagnosis and the unpleasant side effects of these stimulants on the body has many parents questioning exactly what ADHD is and if the medicines given are even doing any good. Some are able to sit still but have a very short attention span, while others will veer towards impulsive and hyperactive behavior. The combined type, as its name suggests has aspects of both tendencies. These behaviors are not only disruptive in class, they can be a hindrance in education. Often these children are very smart, but with the behavior challenges, it becomes very difficult to focus long enough to learn. Even though much research is being done into how this disorder happens in the first place, the actual causes are unknown. Certain links have been found to such things as low birth weight, premature birth, the use of certain things during pregnancy such as alcohol, excessive caffeine, or cigarettes, and the very real possibility of certain environmental exposures. Children exposed to lead are at a very high risk for behavior disorders because of its effects on the brain. For this reason, lead testing is routinely done with children under age 6. Sugar snacks are likely to accelerate the hyperactivity, but there is not enough data to support this being an actual cause. However that is not to say that food isn’t something to be concerned about. Several studies have been done since the 1970’s about the potential of certain food additives making symptoms of ADHD worse. Food dyes such as Blue #1 and 2, Green #3, and Red # 3, and the preservative sodium benzoate are found in many of the popular snack and convenience foods that are marketed specifically for children and busy families. If your child has been diagnosed with any type of ADHD, it is advised that an inventory of foods be taken and as many of these additives as possible eliminated from the diet. The use of stimulants to treat ADHD has much controversy, and many parents resist giving these drugs to their children. The Food and Drug Administration has approved the use of such stimulants as Ritalin and Adderall for ages 3 and over. While the numbers do show that there is an improvement in a child with ADHD and their behavior when taking these medications, there are also unpleasant side effects. These can include extreme difficulty in falling asleep, very vivid nightmares, and a significant decrease in appetite. These side effects usually subside, but it often requires several trips to the doctor to adjust dosages. Getting a child on a regiment of medication is a step that some parents would prefer to avoid and in turn, they will look for alternative treatments. Dr. Ben Feingold (1899-1982), a California pediatric allergist, strongly believed there was a correlation with food additives and hyperactivity. In the seventies, he devised a plan to eliminate certain foods that contained salicylates (a food preservative) and anything else artificial. The diet has been argued by scientific study, which says there is no evidence proving it works. However, for parents and medical practitioners who deal with this on a daily basis, the Feingold diet has met with a lot of positive feedback. Whether a parent chooses to go the route of medicine or changing diet (or a combination of both), the important thing to realize is that each child is different – and each case of ADHD is different. What is effective for one may not work with another. There doesn’t seem to be any absolutes when it comes to these behavior disorders, and when it comes down to it – a parent knows what works for their child. Attention Deficit/Hyperactivity Disorder is something that affects the whole family. The impulsive behaviors and excessive energy are a challenge, and the whole situation can feel extremely unfair, especially to other siblings. Brothers and sisters of these children often have to take a back seat to dealing with the symptoms and feel they are expected to ‘help’. There is also guilt when the child acts up under their watch. It is very easy for a family to feel overwhelmed and frustrated unless action is taken to manage ADHD. First and most important, take care of yourself. The only way a parent is going to be any good for their family is to put their health as a priority. Getting enough rest, making sure you eat right and keep up with your own medical care, and taking time to refocus energy are all crucial and in many cases, not always feasible. Check the local programs in the community, such as Easter Seals. They often have respite programs that allow for a “Parent’s Night Out” where there is child care and appropriate activities for both children with disabilities as well as their siblings. If these are not available, plan shifts for family to take turns so each one has some time to themselves as well. A little organization can go a long way in making life easier for everyone involved. The most important thing to remember when managing ADHD is to acknowledge the child’s limitations in scheduling and completing projects. Until the child is able to develop these skills on his own, it must be done by the parent or caregiver. Consistent structure in the child’s day and keeping active at appropriate times will promote better sleep at night and the basis to develop these habits on their own. There are many good resources on the web to check for advise or support groups. There are thousands of parents dealing with this issue, and many have found that comparing notes and offering an understanding point of view has helped more than any treatment. You, as well as your child are not alone.